In our last post we finished installing Forecast Analysis Reporting. Now we will start on the configuration. Hello everyone, if you have been following along with my guides, you should now have SCVMM installed. 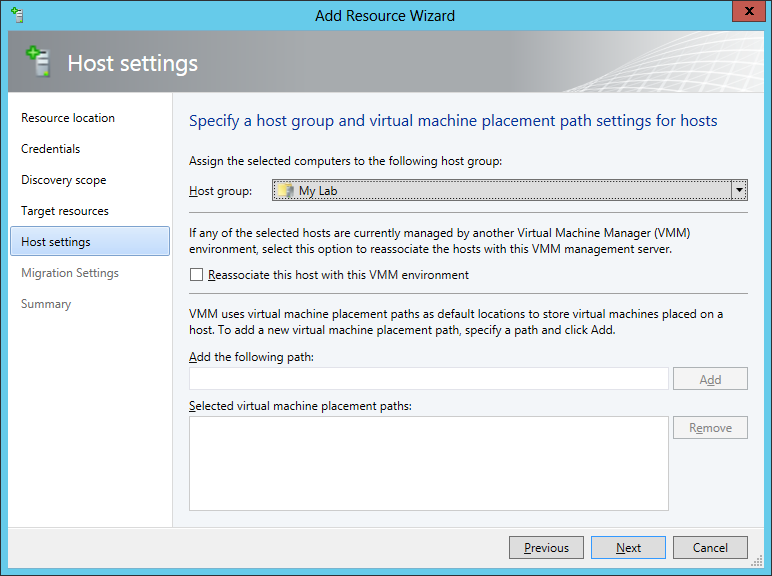 But SCVMM won’t do you any good if it doesn’t know about any Hypervisor/virtualization hosts or VMs, so that’s where we will start as part of these Configuration guides. First, start by launching the SCVMM console. Click on Fabric in the lower left. Now expand the ‘Servers’ directory. From there, right-click on ‘All Hosts’ and choose ‘Create Host Group’. Name your custom Host Group whatever you want. Note, you can rename it at any time if you need to. 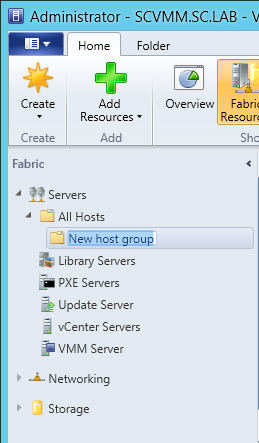 Now right-click on your new Host Group and choose ‘Add Hyper-V Hosts and Clusters’. 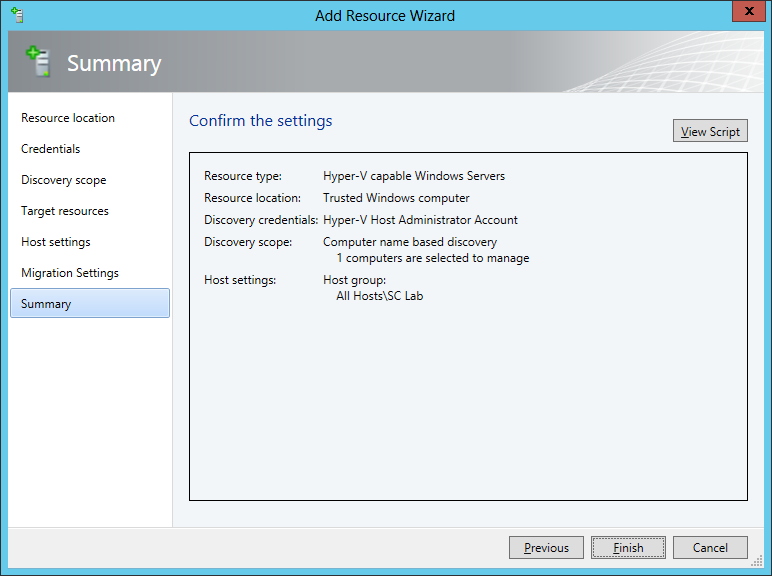 On the Resource Location screen of the Add Resource Wizard, make the appropriate selection for the Windows Computer Location, and then click Next. Note that you can even choose ‘Physical computers to be provisioned as virtual machine hosts’, which would allow you to provision bare-metal systems! 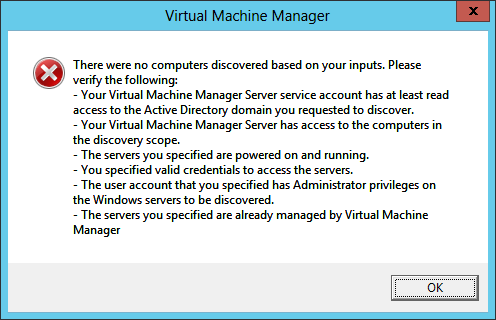 For our lab example, since we have an Active Directory domain that the SCVMM server is a member of, we will choose the first option. 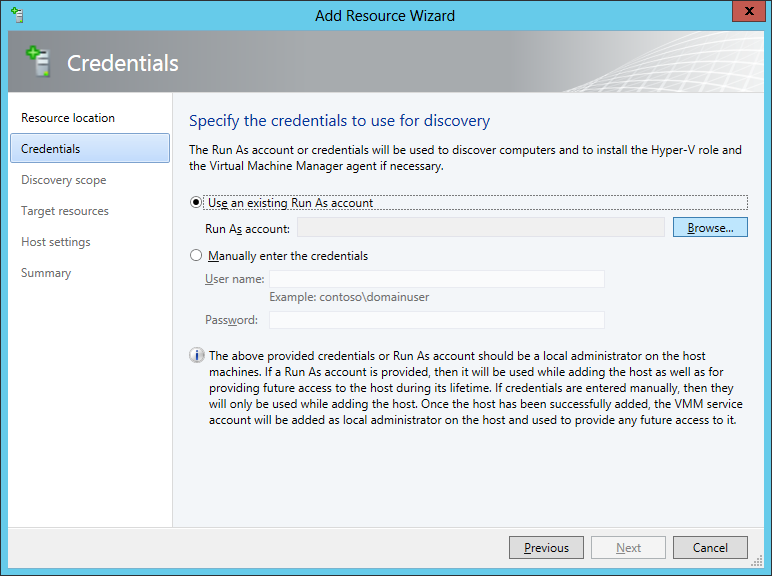 On the Credentials screen, click Browse so that we can add an existing account as the Run As account. Note the information at the bottom of this screen, which reminds us that the Run As account needs to be a Local Administrator on the host machines you want to manage. 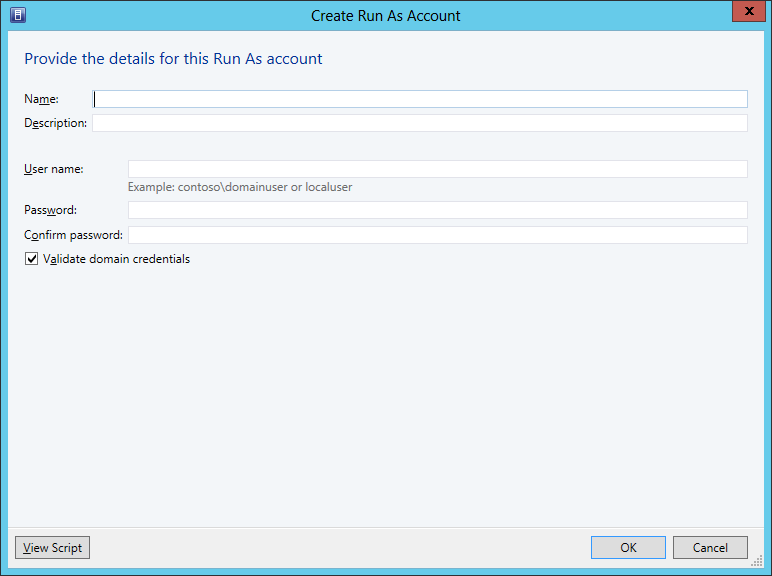 On the Select a Run As Account, click the ‘Create Run As Account’ button, since we don’t have an account already within SCVMM to use. On this screen you need to provide the details about the account. You can give it a name (Note that this is NOT the actual username used for the account, but an identifying name), and description. You will need to provide the actual username and password for the account. 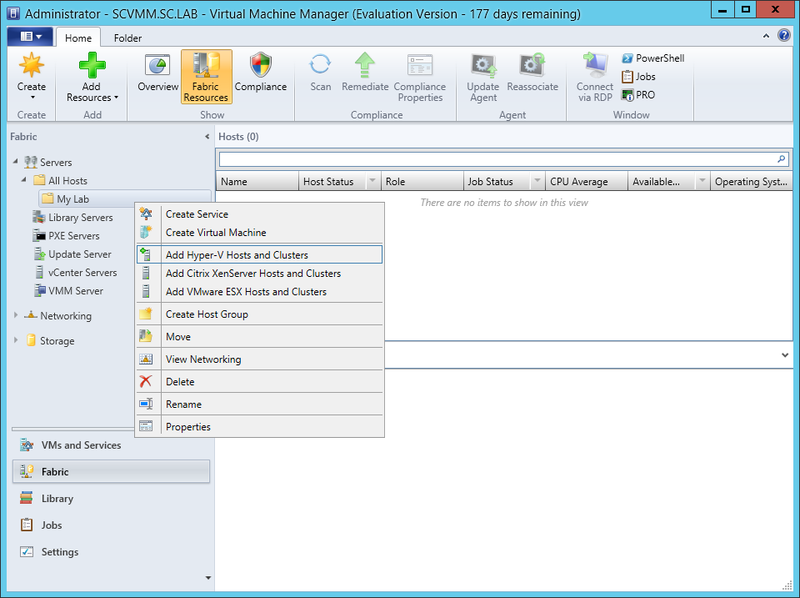 In my lab example I created an account called SCVMMAdmin, and used that on this screen. Enter an applicable account on this screen and then click OK.
Now our newly added account is available to be selected. You will notice in my example that I named the account “Hyper-V Host Administrator Account”. Select your account and then click OK.
Now the Credentials screen will show the account that we have selected. Now click Next. On the Discovery Scope screen, choose the appropriate the scope option. 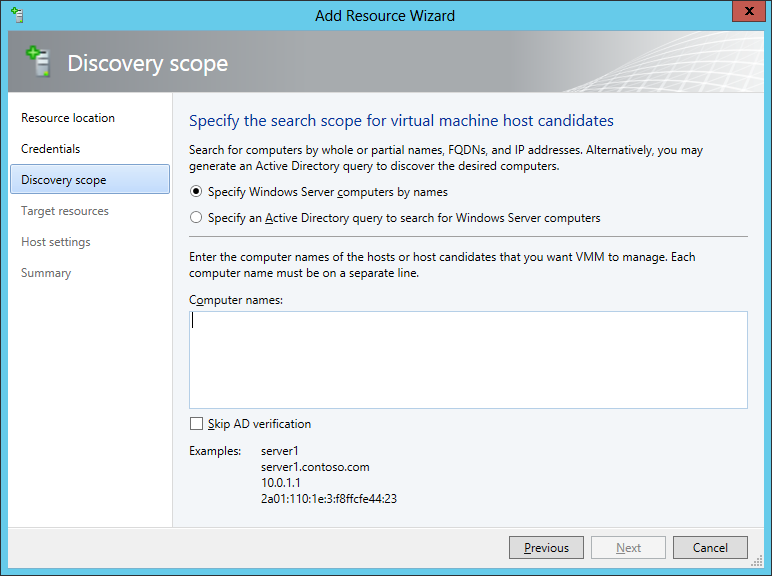 You can use an Active Directory query, or type the names to search for. In my lab example, I just typed the names. Make your appropriate choice and then click Next. NOTE: You can opt to ‘Skip AD Verification’ however it is best to perform AD verification to ensure the system can be communicated with. If there are issues with the wizard not being able to communicate with the Host(s), you may encounter this error. Read the message displayed and then click OK. Perform whatever actions are required to resolve the communication issues, and then re-attempt to add a host system. On the Target Resources screen, if the host system(s) are able to be contacted, they will appear here. Select the system(s) that you want to add as hosts, and then click Next. On the Host Settings screen, you can assign the selected computers to a specific Host Group (i.e. the one we originally created). You could use the Host Groups to organize hosts based on area/zone (i.e. PROD, UAT, TST, DEV, etc.). For our lab example, just click Next. 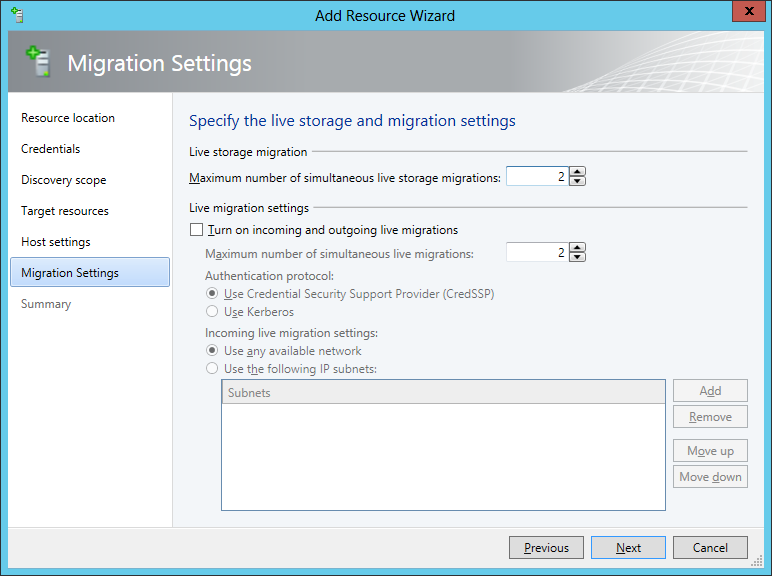 On the Migration Settings screen you can specify how many live migrations (for both storage, and VMs) can be performed simultaneously. For this example in my lab, since I don’t have a second physical host to use for live migrations, I won’t turn this feature on. At this point, just click Next. Review the information on the Summary screen and then click Finish. This will open the Jobs screen, and show the progress of adding the host. If there are any issues, you will be alerted to them here. Correct any issues, and re-attempt to add the host. Once it has been added successfully, you can close the Jobs window. You will notice in my lab example, that adding my host completed but with a Warning. This is because my physical host does not have Multipath I/O. This is used in reference to SAN storage, which I don’t have. Back in the main SCVMM console your Host will now be present. Congratulations, you now have SCVMM installed, along with adding a Host hypervisor (in our case, Hyper-V) system to be managed. Next we will create host groups and clouds. 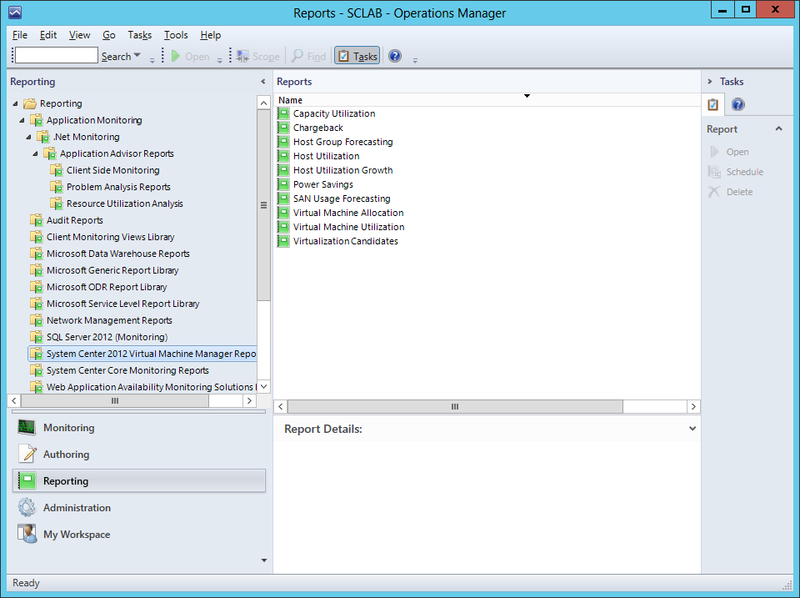 By default, you should now have all the SCVMM reports available in SCOM’s Reporting space. However, there is an additional set of reports that is not made available by default. These are the Forecasting Analysis reports, and the only way to be able to use them is with SQL Server Analysis Services (SSAS). 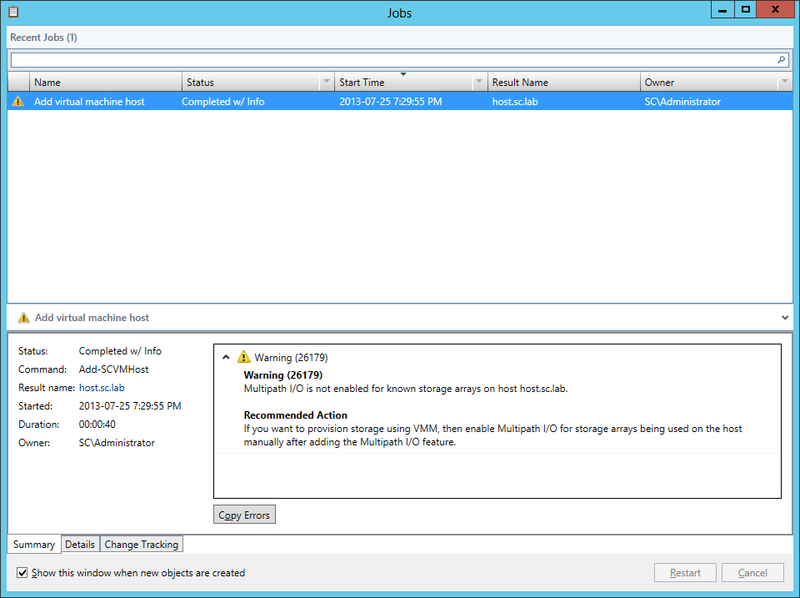 Since SCVMM using the reporting feature of SCOM, we need to have SSAS installed on the SCOM Reporting server. In our lab example, we have SQL DB and Reporting installed on the same server that is running SCOM. 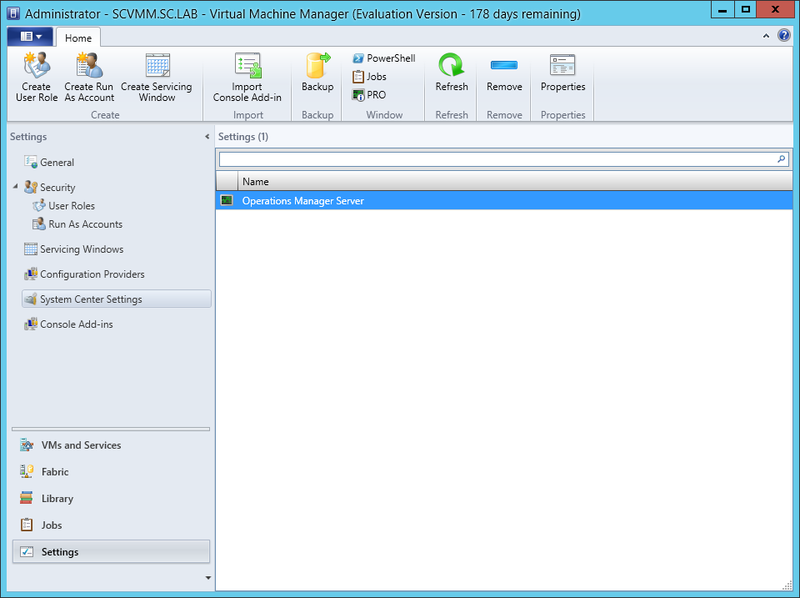 So, we’re going to go through the steps of installing SSAS first, and then configuring SCVMM to use it. 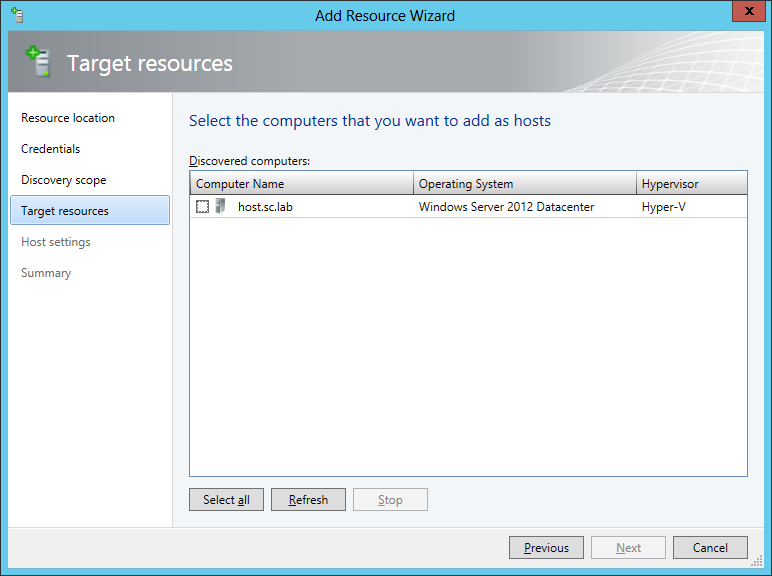 To start, log into your SCOM server. From there, mount the SQL Server ISO or extract it and run the setup.exe. Since we have already installed SQL, I will not repeat each/every step here, since the screens are identical. 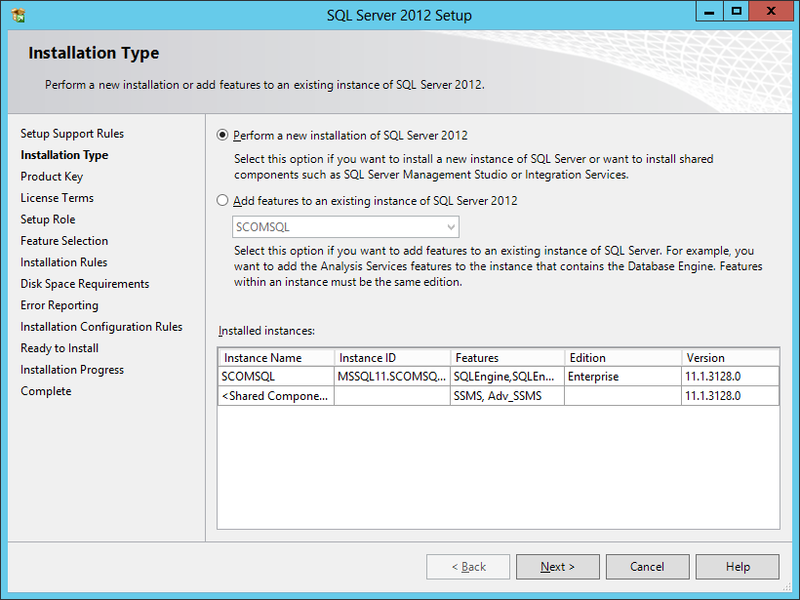 Just walk through the SQL installation process as if you were installing a new instance of SQL. The screens that you need to take note of are, first, the Installation Type. Instead of selecting ‘Perform a new installation of SQL Server’, choose ‘Add features to an existing instance of SQL Server’. Then click Next. You should next be on the Features Selection screen. On here, select the ‘Analysis Services’ feature, and then click Next. Continue clicking Next until you reach the ‘Analysis Services Configuration’ screen. On this screen, add the applicable user(s)/security group(s) for administrative access to Analysis Services. Identical to how I have setup SQL Server, I have added a Security Group to control access. Make the applicable configuration for your environment, and then click Next. IMPORTANT: The previous screen to this one (Server Configuration) is where we (in a normal SQL installation) would change the Collation (see my guide on SQL Installation). I have be unsuccessful in finding any official documentation from Microsoft about the proper Collation for SSAS, especially since SSAS does not have SQL Collation like the SQL Database and Reporting features does. Therefore, for my lab example, I have accepted the default SSAS Collation. Additionally, I have likewise been unable to find any official documentation from Microsoft about the proper Server Mode configuration for Analysis Servers in reference to SCVMM. Therefore, again, I am accepting the default Server Mode of ‘Multidimensional and Data Mining Mode’. Continue to click Next until you reach the Install screen, and then click Install. 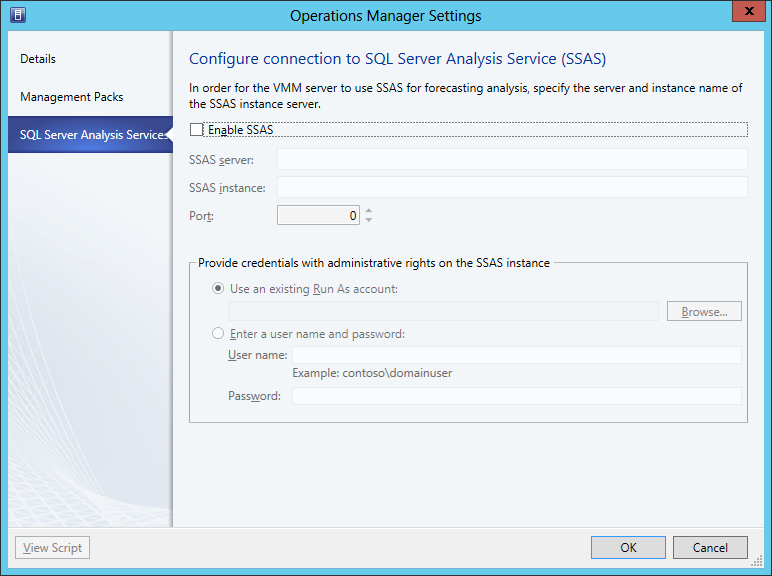 To avoid an error when attempting to enable SSAS in SCVMM, you must install the Analysis Management Objects for SQL on the SCVMM Management Server. 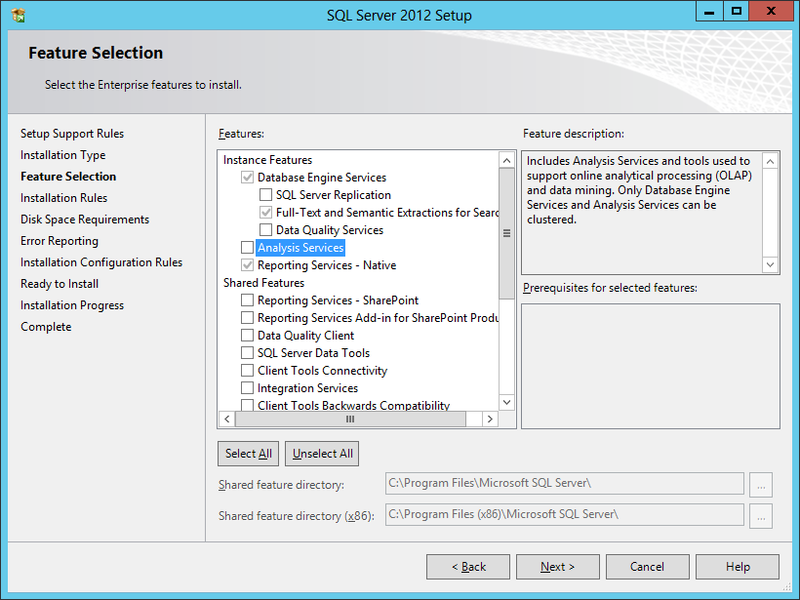 In our lab example, we are using SQL Server 2012. 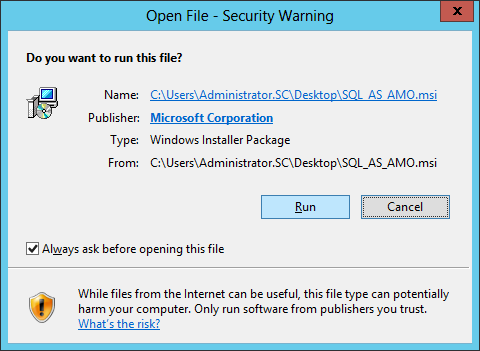 Therefore, to obtain the AMO elements, we need to download and install the Microsoft SQL Server 2012 Feature Pack. You can find the SQL Feature Pack (specifically SQL 2012) here: http://www.microsoft.com/en-us/download/details.aspx?id=29065. 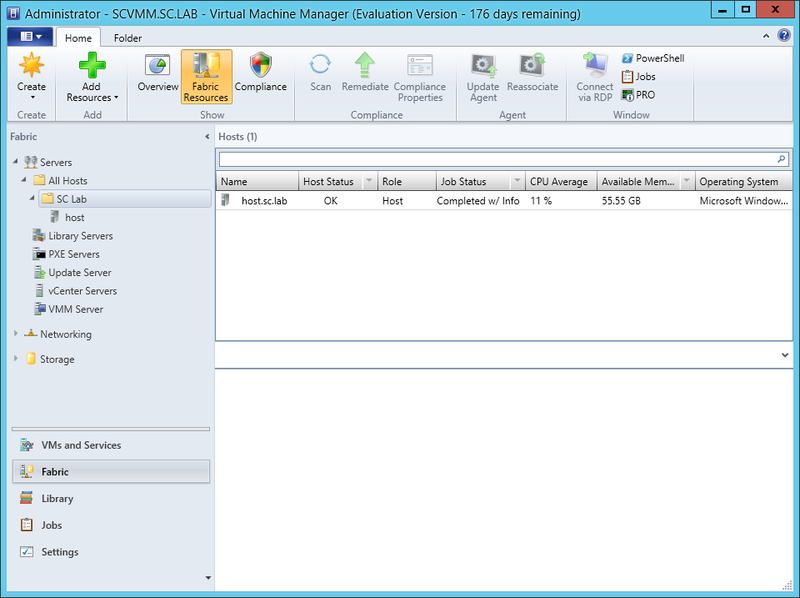 Download the file to your SCVMM Management Sever. Now, start the installation by running the SQL_AS_AMO.msi file and click Run. Read and accept the License Agreement, and then click Next. Now all you have to do is click Install. We now have the SQL Analysis Management Objects installed, and can proceed with enabling the use of SSAS in SCVMM. 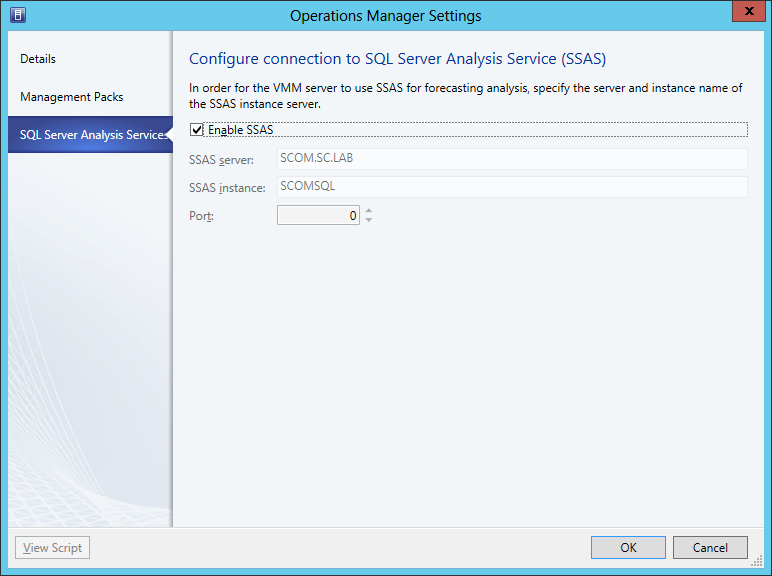 After you have SSAS installed, you can now enable SCVMM to use SSAS and forecasting analysis reports. Log into your SCVMM server, and launch the console. 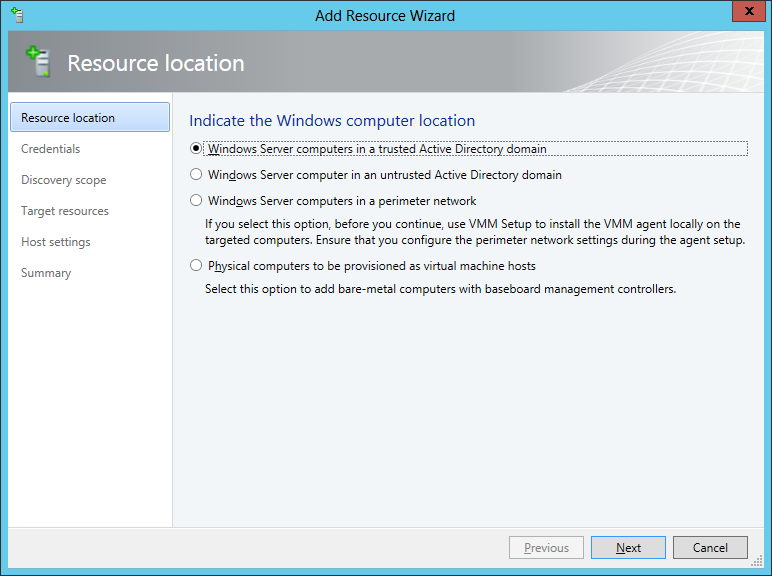 From there, navigate to Settings > System Center Settings > Operations Manager Server. Either right-click and choose Properties, choose Properties from the ribbon menu, or just double click on setting option. Since we already performed the integration steps between SCOM and SCVMM, you should see the Connection Status on the Details screen as “OK”. Click on the ‘SQL Server Analysis Services’ label. 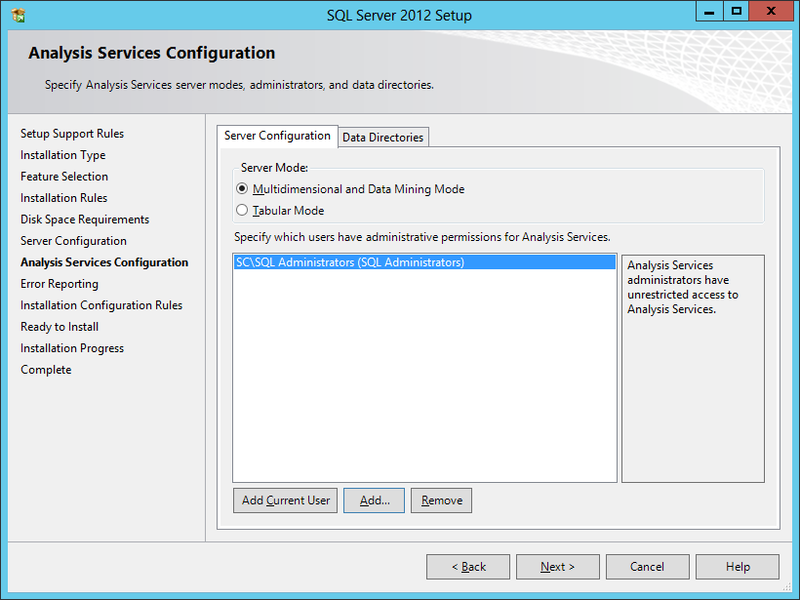 On this screen, check the ‘Enable SSAS’ checkbox. 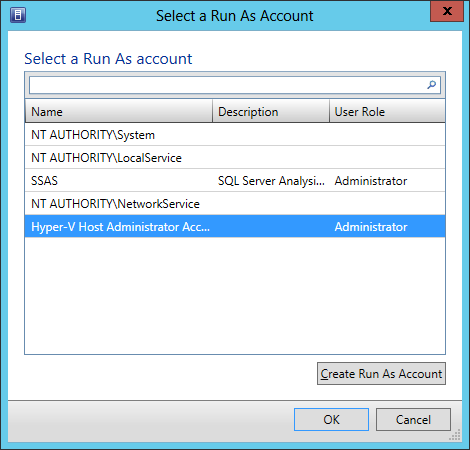 You will then be able to provide the SSAS server name and instance, along with the port, and account to use. In our lab example since we installed all elements on the SCOM server, our SSAS server name is ‘SCOM.SC.LAB’ and my instance name is ‘SCOMSQL’. Make the applicable entries for your environment, and then click OK.
Notice that when you click OK, you may encounter the following message. 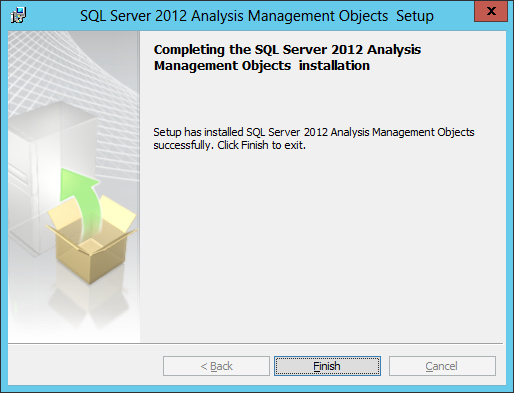 It indicates that the SCVMM server needs to have the SQL Server Analysis Management Objects installed. 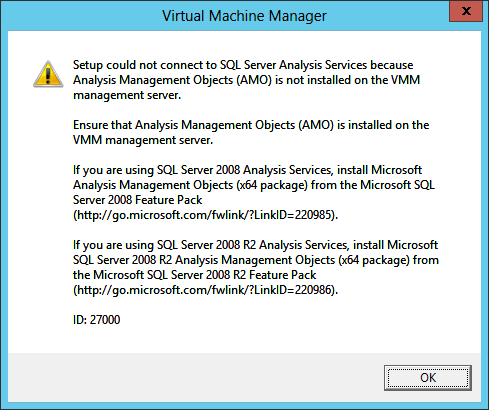 Press OK if you encounter this error, and following the steps detailed in the ‘SQL Analysis Services AMO Install’ section of this document. 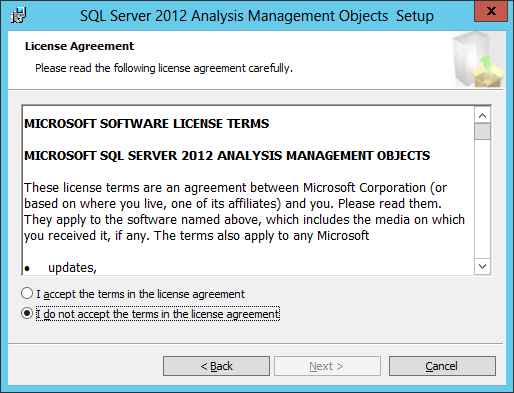 IMPORTANT: Through extensive research, it appears that even if you have SQL Server 2012 installed, along with SQL 2012 Reporting, that you cannot in fact use the SQL 2012 Analysis Services Analysis Management Objects. This is currently applicable with version SCVMM 2012 SP1 UR2. 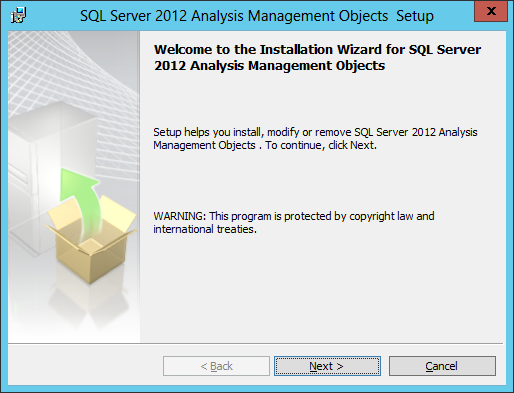 It has been determined that you MUST use SQL 2008 R2 Analysis Management Objects. It is unknown if this will be corrected in a future SCVMM update. NOTE: I cannot take credit for this discovery/solution. Here is the reference page that led me to this conclusion: http://blogs.catapultsystems.com/lrayl/archive/2013/05/20/configuring-the-system-center-2012-sp1-vmm-sql-analysis-services-integration-with-operations-manager.aspx. So at this point, you need to repeat the steps for installing SQL Analysis Services AMO, but with version/feature pack SQL Server AMO for SQL 2008 R2; here is the link: http://www.microsoft.com/en-us/download/details.aspx?id=16978. 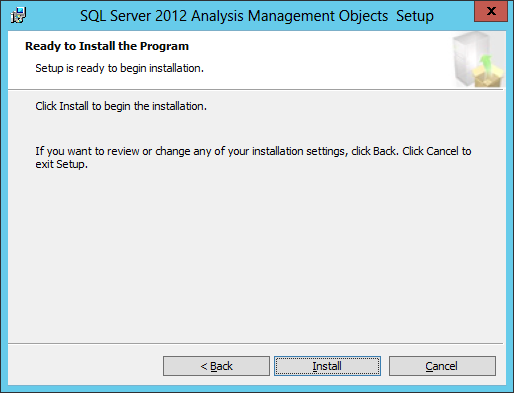 Once you install SQL Server AMO for SQL 2008 R2, then repeat the steps already detailed for Enable Forecasting Analysis. 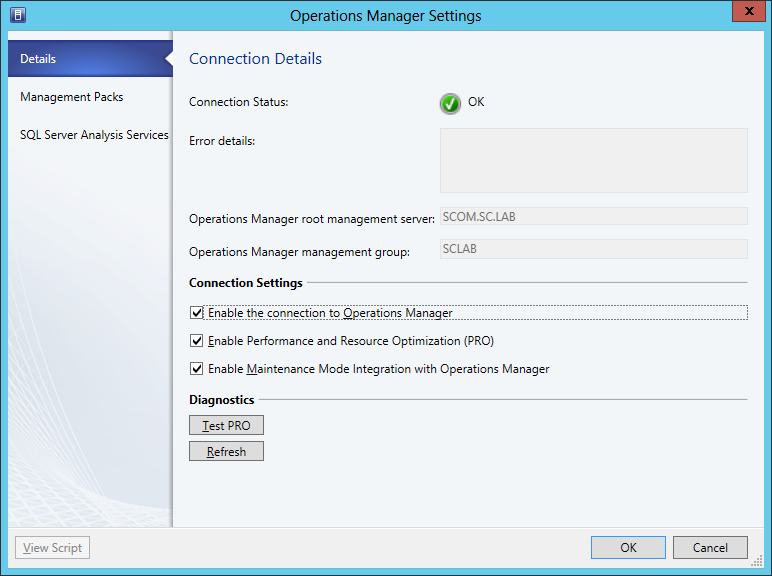 Once you enable SSAS and enter the applicable information and click OK, if everything else is setup correctly the Operations Manager Settings dialog will automatically close. 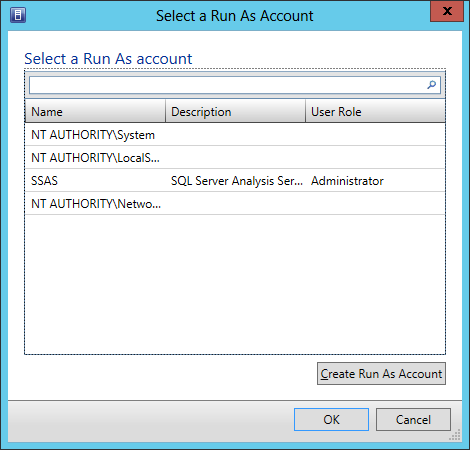 You can re-open it and confirm that SSAS is enabled. And that’s it. 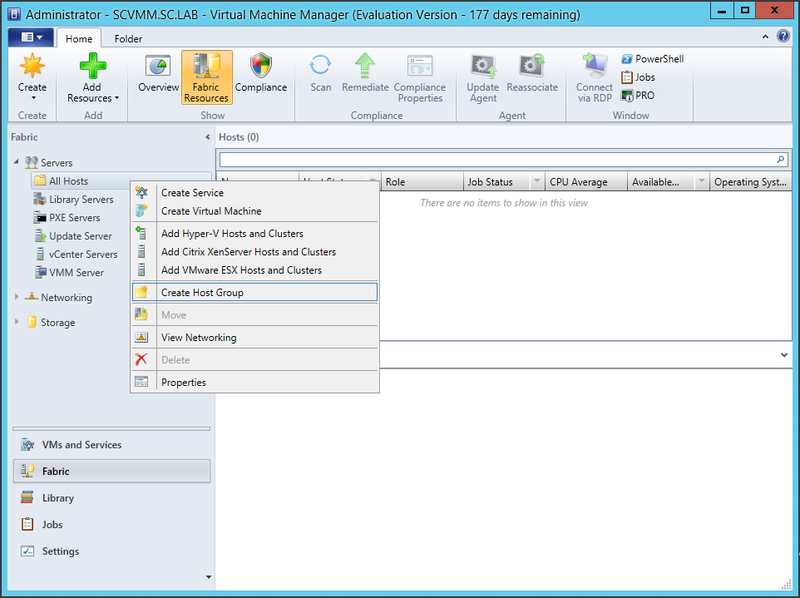 You now have SSAS enabled in SCVMM. The reports already exist in SCOM but now the Forecasting Reports can use the collected information to project data into the future. That completes the Installation Guides for SCVMM. The next part of the series will cover Configuration. Well, after a long week+, I have finally finished building my lab server. The reason why I took so long is because I have friends staying with us for the week. Now everything is put together, and the cabling is perfect. I just turned it on for the first time tonight, and no issues thus far. I was able to check the UEFI BIOS, and it detects my CPU correctly, shows all 8 DIMMS with a total of 64GB of RAM, and the SSDs are showing up as well. I hope to post some pictures that I’ve taken, if my phone ever decides to co-operate with me and upload them to my SkyDrive. Now I am in the process of creating a bootable Windows Server 2012 USB key to start the OS installation. The only issue I currently have is the fact that I only have 1 keyboard/mouse, which are connected to my main PC. So I have to keep disconnecting/switching between both systems until I get a KVM (or the OS installed with a static IP to RDP to it, which is the original plan). Stay tuned.